Observation - Insect Skin - Global. 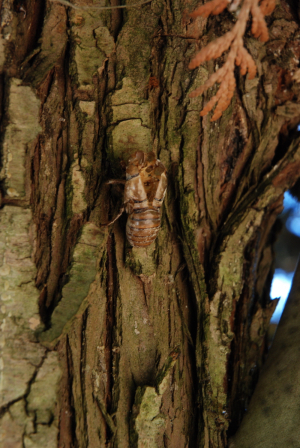 Description: The discarded skin of a large insect, securely fixed to the bark of a tree. It is split down the middle where the insect would have crawled out. The discarded skin of a large insect, securely fixed to the bark of a tree. It is split down the middle where the insect would have crawled out.